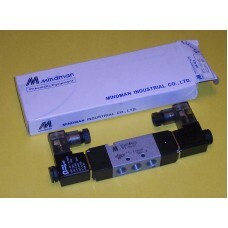 This is a 5 ported 4 Way Directional Control Valve used to move cylinders or actuators. This valve has been replaced by MVSD-180-4E2. Supply pressure must be supplied to the center port on the side of the valve with the 3 ports. The outlet ports on the opposite side are connected to each side of a cylinder or actuator. The pressure will hold the cylinder in one position while the other side of the cylinder is exhausted. When voltage is applied to the solenoid at one end of the valve, the valve spool will shift causing air to go to the opposite side of the cylinder while exhausting the side that was pressurized. This causes the cylinder to shift (or extend). When the voltage is removed, and voltage is applied to the opposite coil, the internal spool will shift causing the cylinder to shift in the opposite direction. Mufflers may be added to the exhaust ports to quiet the air exhausting. Adjustable Exhaust restrictors may be used to in the exhaust ports to control the speed of the cylinder. If flow controls are used, they should always be placed in the lines between the cylinder and the outlet ports and control the air flow as it exhausts from the cylinder.